With the 2018 FIFA World Cup upon us, there is no better time to be a soccer fan (or football fan if you live in Europe, the South Americas, or Africa). The one-month tournament featuring all the best national soccer teams in the world which is only held once every four years has resulted in the spike of soccer-related items being made and sold at a ridiculously high rate. Among those items is the award certificate. 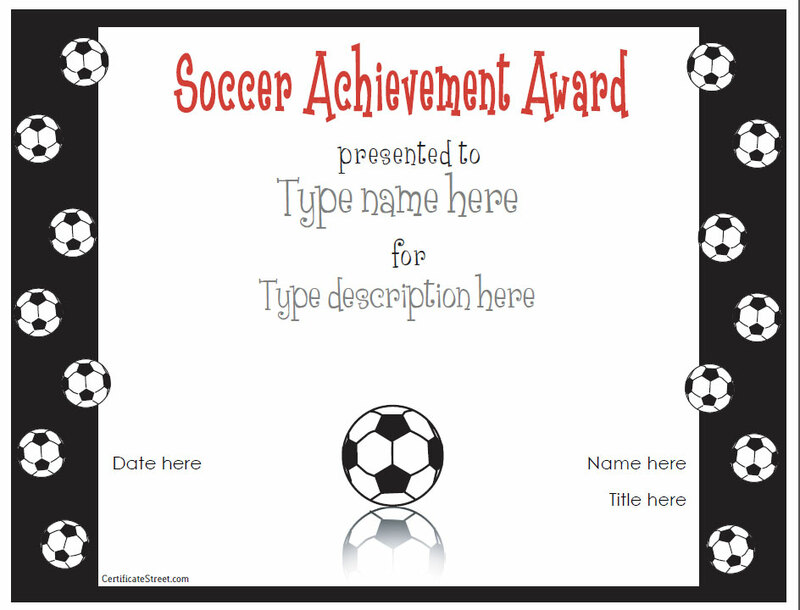 This article will help you create your own soccer award certificate with some examples you can use as a guide. Also, if you are a soccer fan we also included a feature on popular soccer awards to add to your reading pleasure. 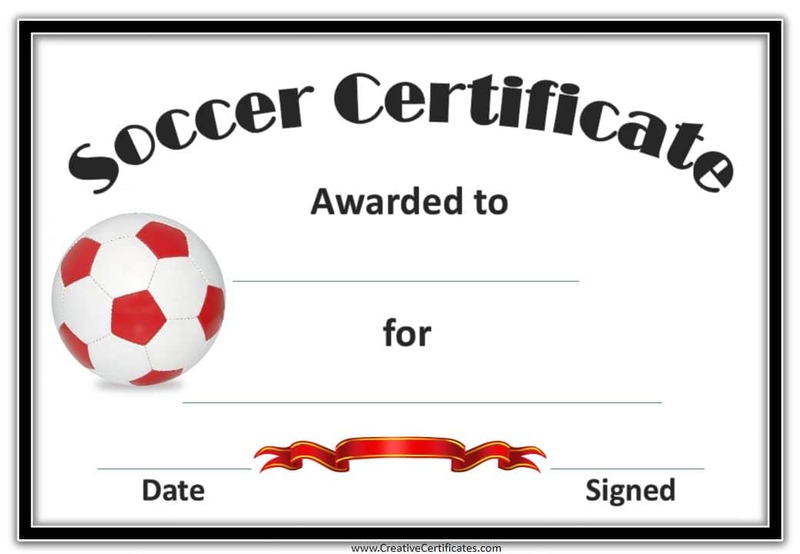 This the most basic yet most important tip when not making not only a soccer award certificate but any type of certificate. 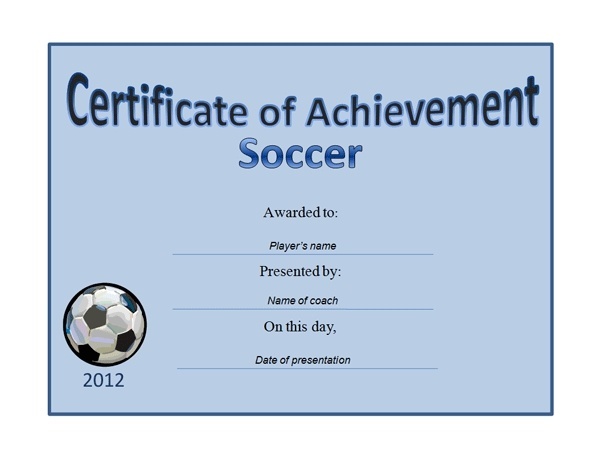 Misspellings are always avoidable, but numerous times the certificate maker misspells the name of the award recipient. Even if a few letters are misspelled, this already becomes discouraging for the recipient. So double-check and triple-check the recipient’s name and other details of the certificate (name and date of the event, certificate citation, etc.). You may also see examples of certificate of achievement. You definitely do not want to give out a blank certificate or a certificate that lacks important details to the certificate recipient. It is an insult for him especially if he worked very hard to obtain that certificate. One of the details you should not miss out is the award that is being won by the recipient. Make sure that the font size you are going to use for the award title is identical or similar to the font size of the recipient’s name. You may also like modern certificate examples & samples. Blank certificates are too dull and boring, so add a little spice to your certificates through incorporating design. The design does not have to fill out the entire certificate as a minimalist design is highly acceptable. You can use the event logo as a background image or you can use various abstract designs related to the event and add them to the certificate. Placing the award in a wooden or plastic frame adds another aesthetic to your award certificate. 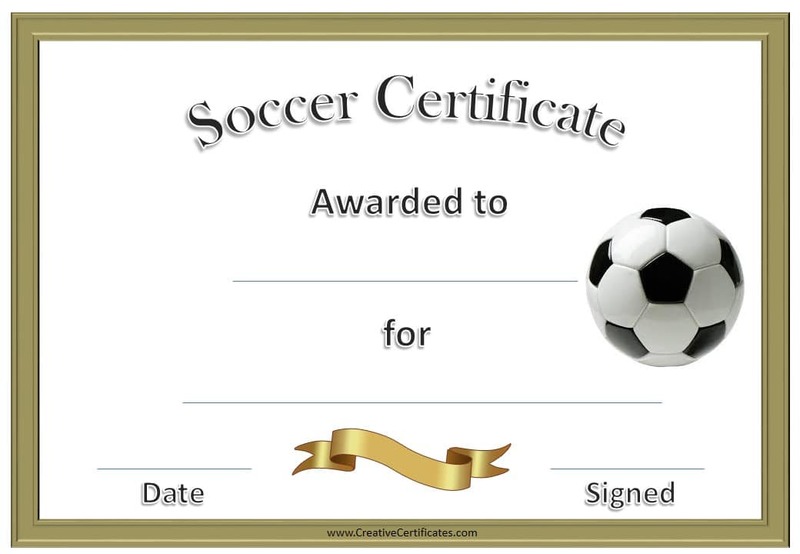 The certificate recipient will truly be appreciative if he received the award inside a frame, not just a piece of paper. You definitely don’t need to overspend for frames, as you can buy the cheaper ones in your local bookstores or department stores. Soccer is dubbed as the world’s popular sport. It is a fact and no other sport comes close (sorry, basketball, baseball, and hockey fans). When you have a sport that is played in almost every country, either inside stadiums, office buildings, or even in dusty streets, then there is no denying its popularity. Soccer is also coined as “the beautiful game,” as players showcase the most magnificent and breathtaking movements with just their two feet. 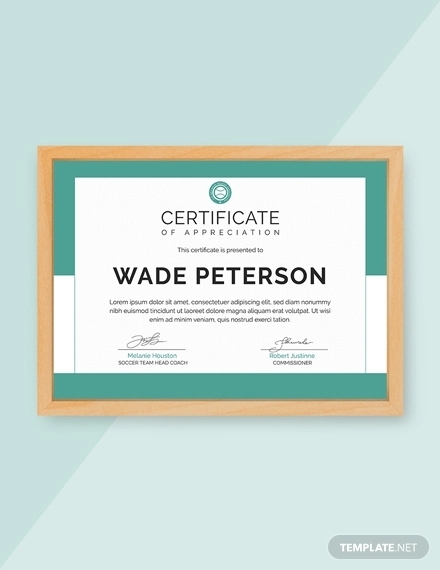 You may also check out examples of certificate of appreciation. Listed below are some popular soccer awards that you may have heard of, and have been awarded to some of the game’s greatest and most influential players. 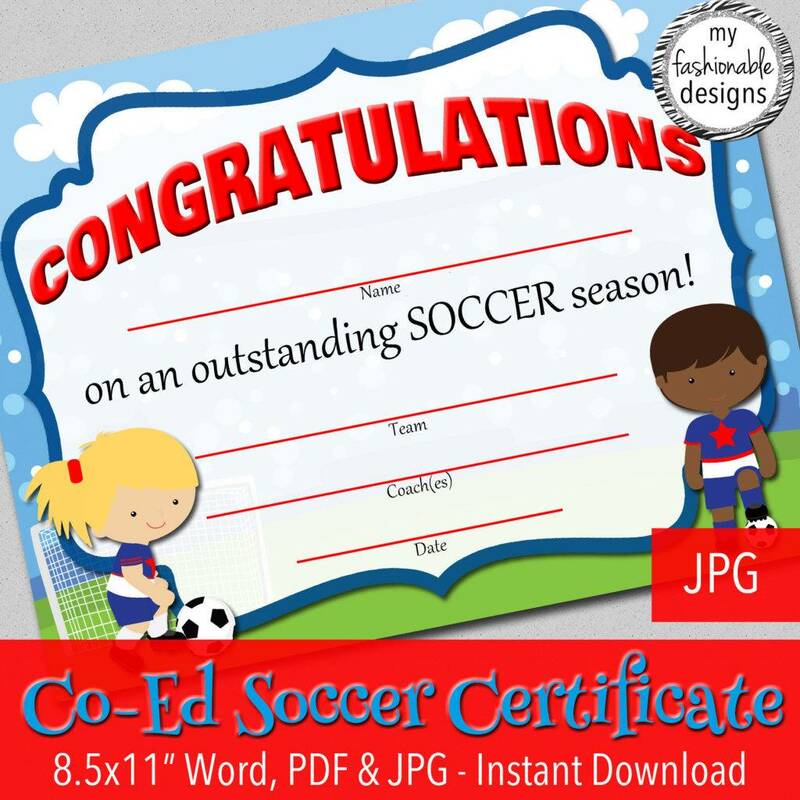 You may also use the awards as inspiration for your soccer award certificates. The Ballon d’Or is an annual award given by the world’s biggest football governing body, the Federation Internationale de Football Association (FIFA) to the game’s best player of the previous year. 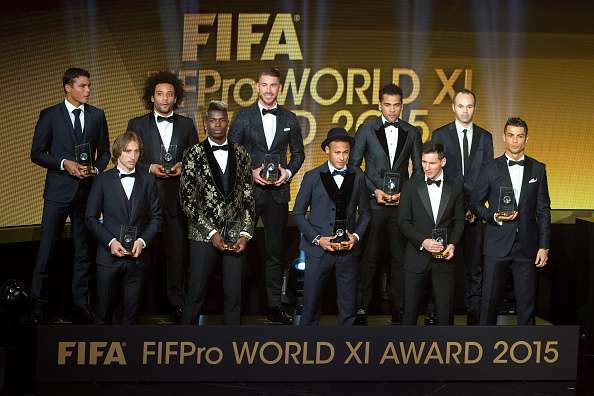 FIFA creates a shortlist of players for the said award, and votes on the eventual winner. 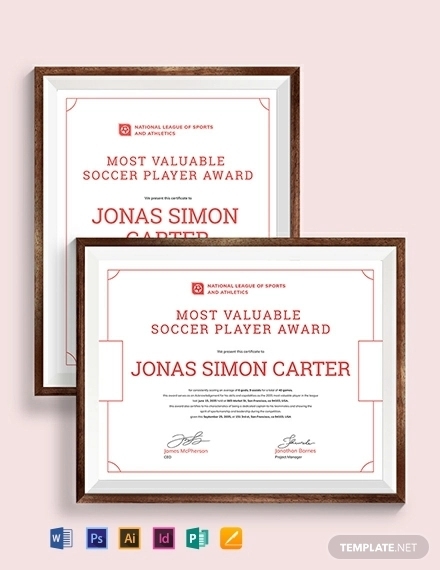 The award is based on the player’s influence on the team (goals, assists, tackles, etc.) and also the team’s success. 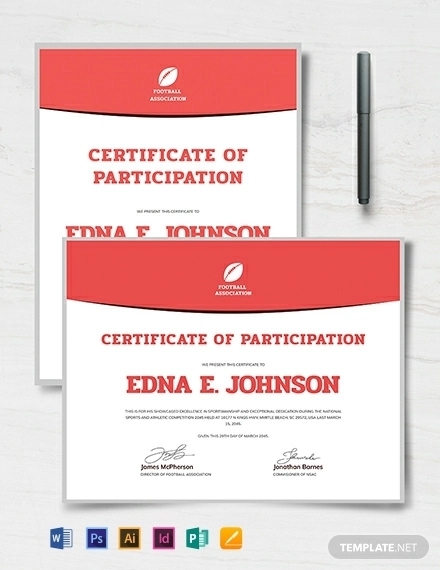 You may also see examples of certification of participation. Individual and team success is important for the player to win the Ballon d’Or. Even if the player scores 20 goals and dished out 20 assists for his club but managed to win zero titles for the entire campaign, then his chances of winning the award is zero to none. The same goes if a player wins multiple titles but had minimal contribution for the club. 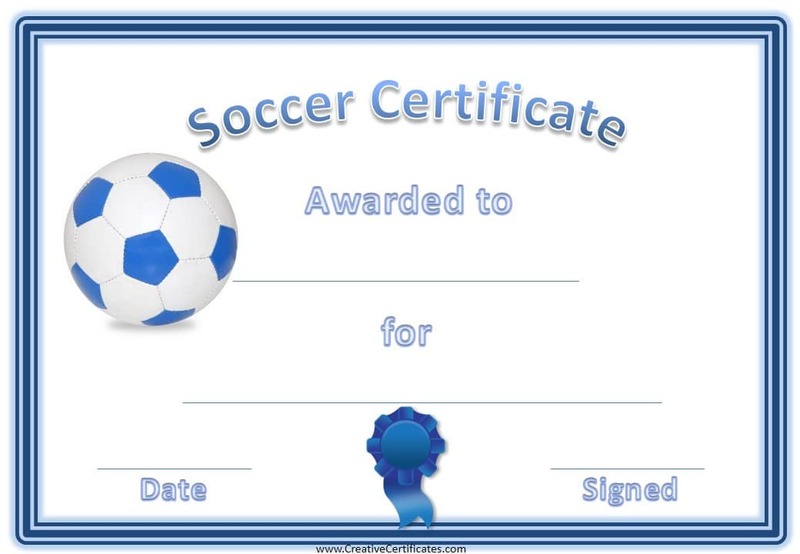 You may also like examples of certificate of completion. If you had been following soccer the past few years, Real Madrid’s Cristiano Ronaldo and Barcelona’s Lionel Messi have been taking turns in winning the award. The two superstars are not only the best of this generation, but arguably are in the argument for being two of the best all-time. You may also check out training certificate examples and samples. There is no denying both players’ success at club level. Ronaldo has a total goal tally of 573 goals (Manchester United and Real Madrid) while Messi has 552 (Barcelona). 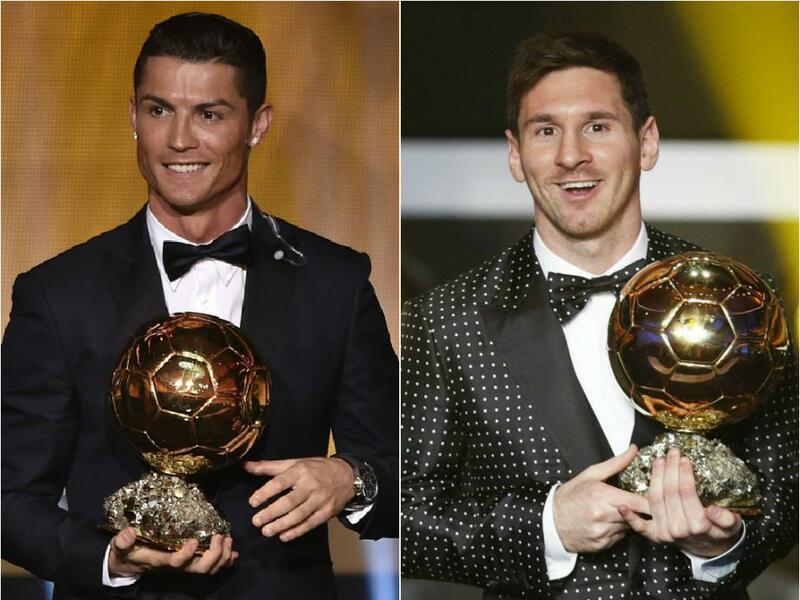 Both players have also won the La Liga, Copa Del Rey, and Champions League multiple times. Although both players have massive respect for each other, there is no denying their rivalry, which has been intensely going on for almost a decade now. When the “Greatest of All Time” tag is on the line, you need to one-up the competition at every opportunity you get. It seems that the only trophy missing from both superstar’s already full cabinet is the World Cup. 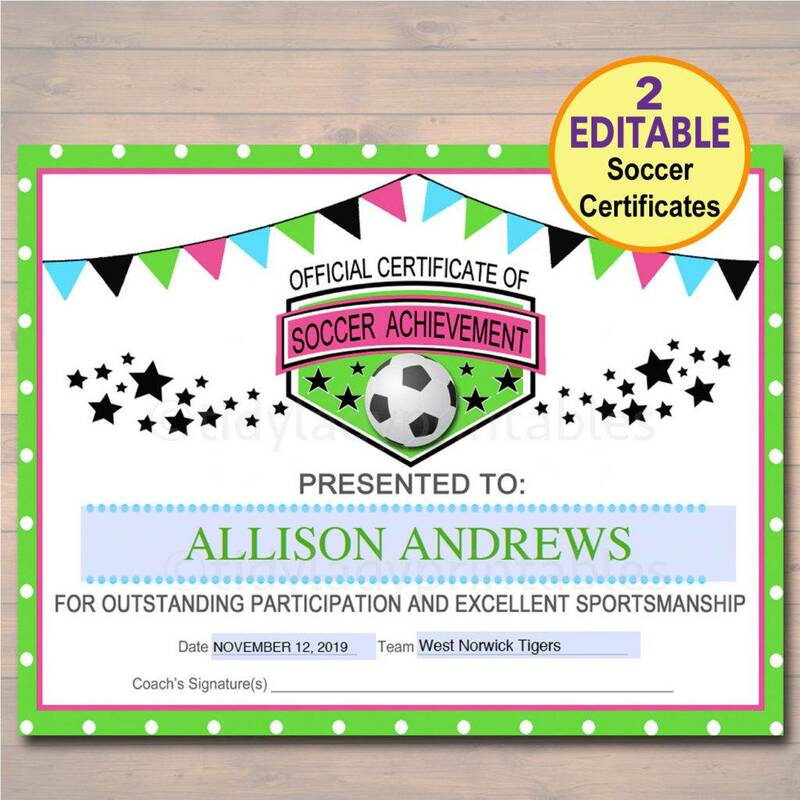 You may also see examples of sports certificate. Messi came close in 2014 when he led Argentina to the finals, only to bow out to eventual champions Germany in a 1-0 thriller with Mario Goetze scoring at the 112th minute. Ronaldo, on the other hand, failed to lead Portugal anywhere near the finals in his previous three World Cup appearances (Portugal’s highest finish at the World Cup with Ronaldo at the helm was 4th place back in 2006). Both superstars have the chance to cement themselves as the greatest ever with a win at this year’s World Cup, and it might be their last chance as well. 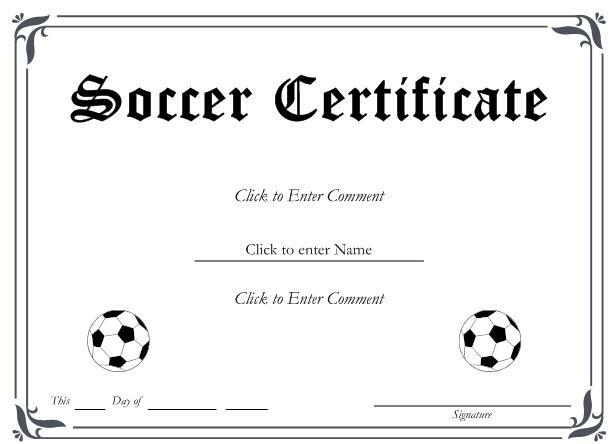 You may also like what is an academic certificate? A good coach wins games, but a great coach wins titles. It would be unfair if only the player and his teammates get recognized, when in fact it is the coach who brings the team together and turns them into a single unit capable of beating anyone in any given night. You may also see completion certificate examples. Similar to the Ballon d’Or, the FIFA World Coach of the Year is given to the coach/manager who has had the most influential presence on his team (superior win-lose record, relationship with players and fans, etc.) as well as winning multiple titles in the process. Among the notable winners of the FIFA World Coach of the Year are Pep Guardiola, Jose Mourinho, and Joachim Low. Guardolia won the award as Barcelona’s manager in 2011 while also finishing top 3 in voting three times, the most by any manager (fun fact: he also had Messi during the entirety of his Barcelona career). You may also like salary certificate examples & samples. Mourinho meanwhile won the award in 2010 after leading Internazionale to a treble. Joachim Low meanwhile won the award after leading Germany to its first World Cup victory after 24 years in 2014—the country’s fourth World Cup trophy overall. The FIFA Puskas Award is basically the smart goal of the year award. Whoever scored the most brilliant, most ridiculous, and most awe-inspiring goal won the said award. The Puskas award is named after former Real Madrid and Hungary forward Ferenc Puskas, who is one of Europe’s most prolific goalscorers of all time. Although choosing the Puskas winner is very difficult, it eventually went to the rightful player. Mohd Faiz Subri’s Cisse-esque goal in 2016, Colombia’s James Rodriguez howler in the 2014 World Cup, and Zlatan Ibrahimovic’s 30-yard bicycle kick in 2013 were among the best Puskas highlights. Soccer has the most passionate fans. The sport has even become an escape for individuals and communities living in harsh conditions. Because of this, violence can never be avoided. Some of football-related violence include fans of different teams being involved in physical conflict, players being subject to fan harassment, and riots before and after games among others. You may also see certificate of achievement examples. Unfortunately, numerous deaths have occurred because of violence that could have been very much avoided. For example, the murder of Colombian defender Andres Escobar after scoring an own-goal in the 1994 Word Cup and the deaths of 96 Liverpool supporters after a stampede occurred during the 1989 FA Cup semifinal between Liverpool and Nottingham Forrest. You may also like gift certificate examples. The Fair Play Award is given to individuals or teams to help encourage and inspire both football fans and players around the world to play and support the game the right way, free of violence and discrimination. Among the winners of the Fair Play Award include the Haiti women’s national under-17 team in 2010 (after the country suffered a devastating earthquake), football communities of Korea Republic and Japan in 2002 (for co-hosting the 2002 World Cup), and Lucas Radebe (for fighting racism in South Africa through football). 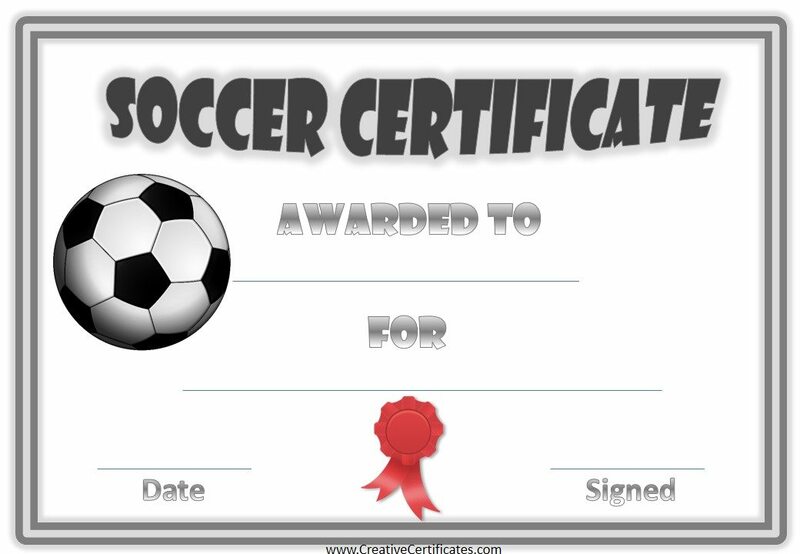 You may also check out how to make your own certificate. Remember that soccer is a team sport. Eleven players operate on the pitch at the same time, each player having his own set of skills to help the team win. There is a player of the year award and there is also a team of the year award. But FIFPro’s World XI does not recognize all the players on the same team, but chooses 11 of the best players from around the world. This is also an annual award just like the other awards that were previously mentioned. You may also see how is a cold war certificate obtained? Three forwards, three midfielders, four defenders, and one goalkeeper are chosen in the World XI. Messi and Ronaldo have made it into the World XI on numerous occasions, as well as Andre Iniesta, Xavi, Manuel Neuer, Iker Casillas, Carles Puyol, Toni Kroos, Ronaldinho, Kaka, Marcelo, Gianluigi Buffon, John Terry, and Steven Gerrard among others. 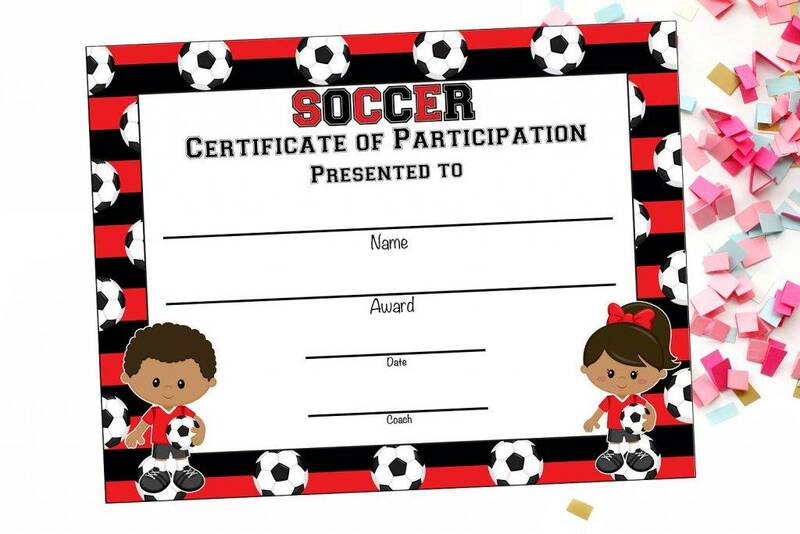 We hope you enjoyed reading this article as well as finding it informative when you will be making your own soccer award certificate. 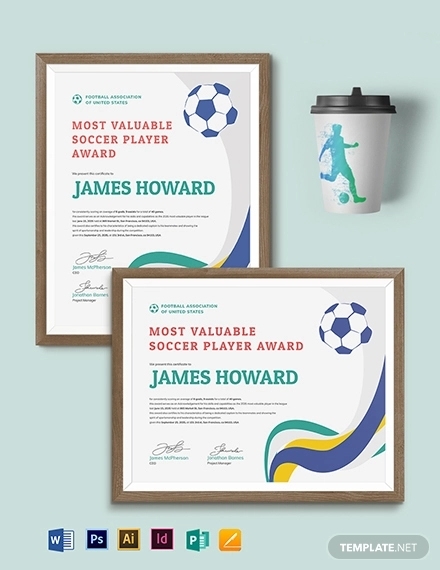 Award certificates are easy to make, but make sure you incorporate the important details to make it more visually appealing.